Astronomers have discovered an object that is in a companion orbit to the Earth. It is a first. Asteroid 2002 AA29 is only about 100 metres wide and never comes closer than 5.8 million kilometres (3.6 million miles) to our planet. But it shares the Earth's orbit around the Sun, at first on one side of the Earth and then escaping to travel along our planet's path around the Sun until it encounters the Earth from the other side. Then it goes back again. Researchers are speculating that 2002 AA29 could be visited by astronauts or used to understand the threat to our planet posed by such rocks from space. 2002 AA29 was discovered by the linear automated sky survey project on 9 January 2002. Martin Connors of Athabaseca University in Canada writes in the journal Meteoritics and Planetary Science that it "moves in a very Earth-like orbit," and is the "first true co-orbital object of Earth." General Simon Worden of the United States Space Command described it as a "near-Earth object that is close to being trapped by the Earth as a second natural satellite". According to Helena Morais of the University of Lisbon and Allesandro Morbidelli of the University of Nice, writing in a paper to be published in the journal, Icarus: "2002 AA29 seems to be in a temporary horseshoe-like orbit with the Earth." This puts 2002 AA29 is in the same class as 3753 Cruithne, a similar rocky body in a horseshoe orbit around the Earth. But astronomers classify 2002 AA29 as the first real co-orbital body found associated with the Earth because it more completely shares the Earth's path around the Sun. Co-orbiting asteroids have been found around other planets. Over 1,200 so called "Trojans" have been found moving either ahead or behind Jupiter. Eight such objects have been found associated with Mars. But despite detailed searches no one has yet found any Trojan objects near the Earth. 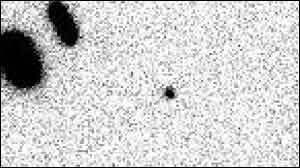 It is clear that 2002 AA29 was discovered by accident at a time when it was at one end of its horseshoe orbit and, being at its closest to the Earth, was bright enough to be detected in an automated sky survey. Detailed observations of its trajectory through space show that 2002 AA29 will reach its minimum close approach to the Earth - 12 times the distance between Earth and the Moon - at 1900 GMT on 8 January 2003. Thereafter it will travel ahead of the Earth moving faster than our planet does, until after 95 years it will catch up with the other side of the Earth and then reverse its motion. Analysis of 2002 AA29's motions have revealed a remarkable event that happens to it every few thousand years. In AD 550, and again in AD 2600 and AD 3880, the rock become, for a while, a true satellite of our planet, in effect Earth's second moon, although technically it will remain under the gravitational control of the Sun. It remains a second moon to Earth for about 50 years until it escapes. Although only about 100 metres across, 2002 AA29 may play a role in the manned exploration of space out of all proportion to its size. Already researchers are speculating that it could be visited by an unmanned spaceprobe or even become the first object after the Moon to be stepped on by astronauts. The object could tell us a lot about the composition of asteroids. Some have speculated that it could be nudged into a permanent Earth orbit where it could be studied at greater length.